Getting high pressures out of a pump small enough to fit in a jersey pocket is always a challenge, but GT have nailed it with their Attack Mini Pump. Maximum tyre pressures are achievable and you don't have to have arms like Popeye to make it happen. It doesn't matter how light the pump is, or how much air in a stroke the barrel can put out, if it isn't secure on the valve then it's worthless. 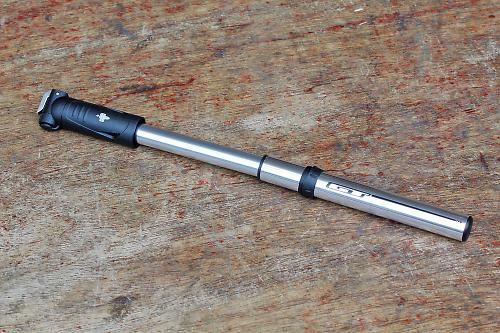 To ensure a tight fit for the Attack, GT use a thumb lock, a simple right angled piece of aluminium that you can push over with your thumb while pushing the head on to the valve. It stays in place securely with a vice-like grip, taking the tube from flat all the way up to rock hard. 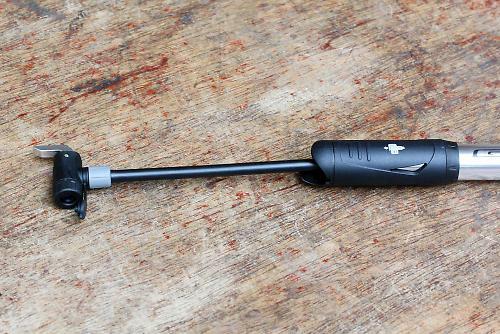 When in storage the Schrader/Presta pump head snap-fits into the pump handle, but for ease of use it's attached to a flexible hose that gives you an extra 130mm of length. I always find a hose helps because it stops the movement of the pumping motion from pulling at the valve and head connection. A claimed maximum pressure of 120psi from a mini pump is always treated with scepticism, but hats off to the Attack. It gets there, and relatively easily too in terms of effort; it just depends whether you have the time because you're looking at more than 220 strokes. The last few taking some real pushing as well. A more real world pressure of 100psi (25mm Contis) takes around 190 strokes, but it's not an effort to get there. The barrel gets a bit warm, but as long as you manage not to pinch your fingers between that and the plastic handle then the whole thing is a pretty easy operation. Which is exactly what you want when you're on the side of the road in the dark, freezing rain cutting your face in the gale force wind – because we all know that's when punctures usually happen. The overall finish feels a bit cheap, but to be fair the Attack is cheap – though I think £16.99 for the performance is a bit of a deal. The sharp edges on the handle can catch your fingers and when your hands start sweating you can get the occasional slip, but overall the GT Attack is a great little mini pump with a well thought out design and secure performance. It's earned its place in my commuting rucksack – or you could attach it to your bike, as you get a small frame bracket and some extended cage bolts in the pack. It's a high pressure mini pump that's the perfect size for a rear jersey pocket. It does the job and at the end of the day that's the whole point. Pinching my skin between plastic handle and barrel - best to wear your mitts. It's a brilliant little pump that delivers highly on performance for such a cheap price. What are it's dimensions please ?